Egypt's Foreign minister Sameh Shoukry reiterated Monday, at a meeting with EU Commissioner for Home and Migration Affairs Dimitris Avramopoulos and the German and Austrian foreign ministers in Brussels, that Egypt will not establish refugee camps for migrants, saying "refugees and migrants live freely and enjoy the services provided to Egyptian citizens." Shoukry said that what Egypt requires is support to provide a decent life and services to refugees, ministry spokesperson Said Ahmed Abou Zeid said in an official statement. The officials met to discuss irregular migration, as the EU has said it considers Egypt a significant partner in both stemming the flow of irregular migrants to Europe through the Mediterranean, and preserving European security. 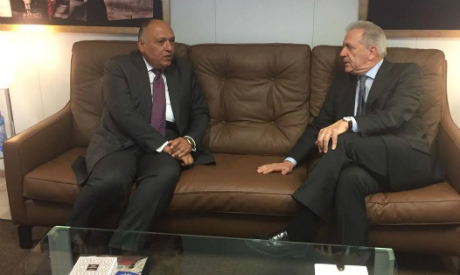 Avramopoulos expressed to Shoukry the EU's willingness to cooperate with Egypt in controlling borders. Shoukry discussed Egypt's efforts to fight irregular migration, pointing to its success in preventing the illegal departure of migrant boats from the country since September 2016. The foreign minister said illegal migration is not only an issue of security, but must also be seen in light of the social and economic reasons behind it. Austrian Foreign Minister Sebastian Kurz proposed on Sunday the creation of EU reception centers for refugees outside the borders of the union, citing Georgia and Egypt as potential locations. Last week, Egyptian President Abdel-Fattah El-Sisi and German Chancellor Angela Merkel underscored the importance of cooperation in combating terrorism and irregular migration during a press conference in Cairo. El-Sisi spoke on the country's ongoing efforts to curb illegal immigration, a key concern for European countries facing a growing migrant crisis. The president said that Egypt currently hosts 5 million immigrants from different nations who live their lives normally, receive the privileges enjoyed by Egyptian citizens and are not confined to refugee camps. Egypt has repeatedly opposed proposals to build refugee camps to house illegal migrants on the African continent. Last year, Egypt passed legislation to combat irregular migration to Europe from its shores. Shoukry arrived in Brussels Sunday on a visit, during which he is scheduled to meet with the foreign ministers of 28 EU countries. He has met already with Jens Stoltenberg, Secretary General of NATO, to discuss political and security challenges in the Middle East. The foreign minister met earlier today with Belgian FM Didier Reynders, to discuss bilateral relations, especially economic and investment opportunities. The officials also tackled regional issues, including the crises in Libya, Syria, and Yemen, and the fight against the Islamic State militant group. On Sunday Shoukry met with Federica Mogherini, the High Representative of the European Union for Foreign Affairs and Security Policy and Vice President of the European Commission, to discuss Egypt's economic reform programme; ways to enhance its partnership with the European Union; and how to handle regional crises. The Egyptian FM is scheduled to sign an EU-Egypt association agreement — under negotiation since February 2016 — which would frame the country’s relationship with European institutions over the next three years. During negotiations, Cairo assured the EU that the agreement would be based on Egypt’s 2030 development plan. An EU delegation is set to visit Egypt mid-March to continue talks on how to implement the agreement.